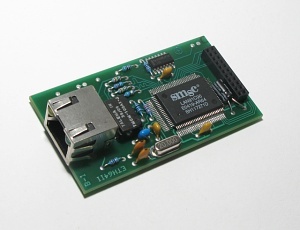 ETH64II is a device for IDE64 which allows connect C64 into (TCP/IP) network. 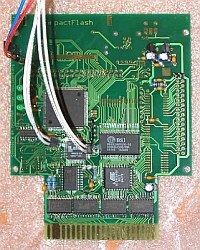 The device is based on LAN91C96 chip. 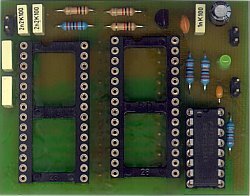 DUART card is a data communication device based on 68C681 compatible chip that provides two fully independent full duplex asynchronous communication channels (RS-232). The card is industrial designed and allow user to select the 23 different standard bit rates from 50 to 115 200 bps. It can be used for all standard serial RS-232 devices. DUART is supported in the IDE-DOS to provide serial PC-Link. PC-KEYB card is a device which allows user to replace standard C64 keyboard with any PC PS/2 compatible keyboard. 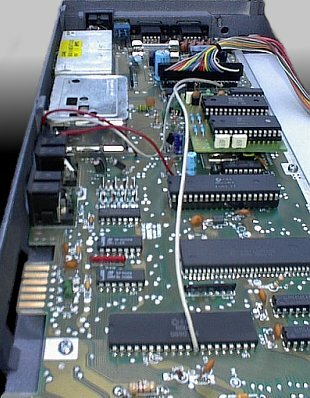 The device is based on ST M3493B2 (GM62093A) crosspoint switch and AT89C51 8-bit microcomputer. Project implements CPU 6510 core with increased instruction set for access to 16MB address space, IDE interface SW compatible with current IDE64. Memory PEROM 512kB, RAM 512kB with the possible expansion. Real time clock chip DS1302 backed by battery and simple USB 2.0 device controller. This small device enables user to replace SID 6582 (SID 8580) with double SID (stereo SID) solution. The second chip can be enabled anywhere in the range of addresses $d420 to $d7ff. MP3 player is a device which allows playing MP3 audio files on standard C64. The device is based on STA013 MPEG 2.5 Layer II Audio Decoder and is able to play MP3 audio files up to 128 kbit (44kHz, stereo) on standard C64 or up to 196 kbit on C64 with SuperCPU.